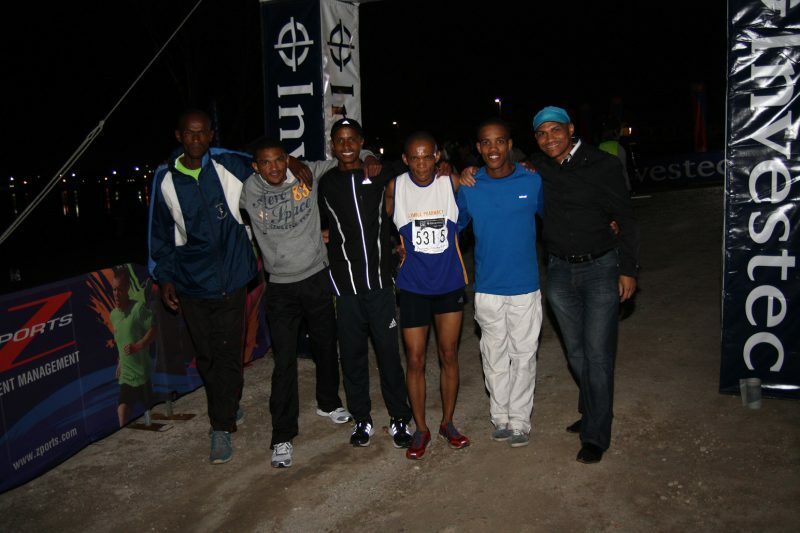 It was an evening of record breaking at the second leg of the Investec Night Relay on Thursday, with athletes in the running and walking categories registering improved performances. Not only were records shattered on the 21km course around the North End Lake in Port Elizabeth, but event organiser Mike Zoetmulder of Zports recorded the most entries in the three-race series so far. Current leaders and defending champions, Gamble Pharmacy, managed to push even harder this time around after breaking the 2012 course record at last month’s series opener. Their five-man team crossed the finish line another 14 seconds faster to record a winning time of 1 hour 4 minutes and 42 seconds. “They managed to pull this off despite one of their star team members still recovering from the Two Oceans Half Marathon which took place in Cape Town last weekend,” said Zoetmulder. Gamble Pharmacy’s Uitenhage-born Olympic marathon runner Lusapho April did not only take part in the Two Oceans, he managed to clinch second place behind winner Stephen Mokoka. “I took it easy on Thursday after some serious training for the Two Oceans,” said April. April, who will be in Germany competing in the Hannover Marathon, will miss the final race of the series on May 2. “Gamble Pharmacy are more than two minutes ahead of their closest rivals (the NMMU Young Guns who finished second on Thursday), so it will be difficult to close the gap, even without April,” said Zoetmulder. Gamble Pharmacy team member Mariano Eesou was not worried about having to compete without April, as he had confidence in his team. Eesou was also thrilled about their latest performance. The Rawstron family team proved yet again that they are a force to be reckoned with in the walking category, increasing their series lead to more than 12 minutes. They shaved 46 seconds off their previous record to win in 1 hour 27 minutes and 6 seconds. “They are way ahead of the competition and are set to become this year’s champions in their category,” said Zoetmulder. For the Rawstrons the event is just about having fun and bonding as a family. “We don’t train at all,” said daughter Tammy. “My parents take part in the odd race from time to time, but none of us train. We just really enjoy participating and the event is spectacular, so we will keep on coming back. Zoetmulder said he was very impressed with the turnout of the second race. “We had more than 80 teams competing. Only 50 participated in the first race, so this is a considerable improvement. Zoetmulder added he was confident that the final race would attract even more teams. Participants also stand a chance of winning lucky draw prizes and have an opportunity to sample live entertainment, food stalls and the beer garden. For full results and event details visit www.investecnightrelay.co.za. Alternatively, stay up to date at www.facebook.com/businessrelay.